Hi everyone! This is my next project, Fidget Spinner RPM Counter or Arduino Tachometer with Hall-Effect Sensor. Using Hall-Effect Sensor we can measure the speed of rotation. I used Hall-Effect Sensor - a3144. RPM (Revolutions per minute) – the number of revolutions per minute. Revolutions per minute – a unit of measurement of rotational speed: the number of complete rotations made by the body (fidget spinner, wheel etc.) around a fixed axis. Used to describe the speed of rotation of the mechanical components in the mechanisms and machines. To measure the speed of rotation on the Fidget Spinner must be mounted a part of neodyimium magnet that affect the Hall sensor after each complete turn of the Spinner. The presence of a magnetic field is indicated on the LED. LCD 1602 indicates current RPM, maximum RPM and tachometr bar (from 0 up to 1260rpm). 1260 rpm is my personal record. Also you can use Arduino IDE serial port. 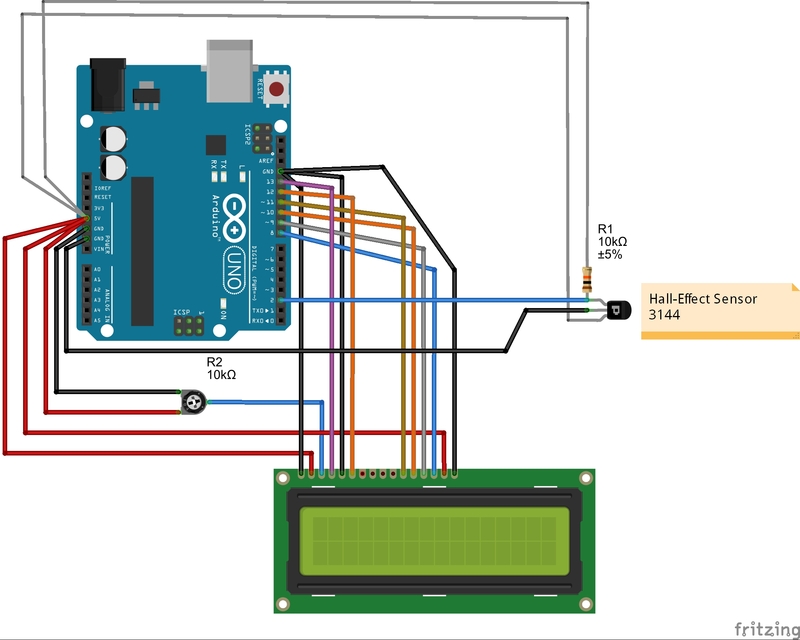 I used a Hall-Effect Sensor A3144 and it worked well just connected to the pin 2 of Arduino Uno board. Also I tried to use a Hall-Effect Arduino module just like this one and it worked very bad. I recommend not using this module bacause of false harmonics. Thank you all! Please, write in comments about your Fidget Spinner RPMs!